Could this be modified/changed to always SHOW helmets, even during conversations ?? Would you mind that I translate this page into Chinese and pull it on Dragon Age Ttieba?It might be easier to make Chinese understand all information about this mod. So I know this mod is fairly old but Im hoping someone can help me find a solution to a problem im having with it. I use the DAmodmanager to install(note: Ive also used the updater and the DAmodder) it seems ti install just fine, I have the book in my inventory. My problem is when I "use" the book my helmet that I have equipped is unequipped and place back in my inventory. When i first installed this mod i received no error message that the Author describes but upon reinstalling it i then began to receive said error message with a list of solutions. However from what i can tell none of my other mods should conflict with this mod! There are no files labeled BTIM in my overrides folder and I have no other mods that effect helmets. Has anyone come across this problem before or can anyone coach me through a possible solution? Works fine for me on all compains, thanks you for that, but with a slight problem. When i started playthrough with Dwarven Noble, the book was removed from my inventory just like all other collected quipment ( because of the story). So i need help( a little bit), can you tell me this book ID so i can add it back again to my inventory, because i want to see Grey Warden helmet(from one amazing mod) on my Alistair. 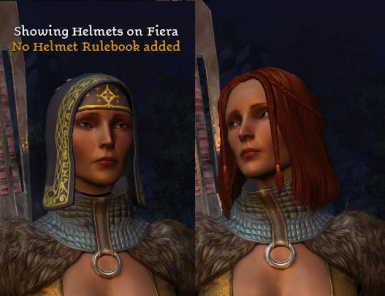 So I kept having the same issue happen to me, just like many others, and this mod is not the cause for helmets getting unequipped the moment you try to wear them. What causes this is a .gda file which is part of the 'Dragon Age Rules Fixpack' mod. To fix this simply delete a folder named 'Tweak - No Helmet' inside the 'GT Core Rules Fixpack - BETA' folder which should be located at "...Documents\BioWare\Dragon Age\packages\core\override". Installs trouble-free with NMM, works perfectly in 1.05 ultimate. I've been using this mod for almost a decade and it never acted up. No idea why so many ppl have trouble getting this to work. It's drag n drop. Made a new save in camp with all helmets equipped, installed the mod, restarted the game and loaded the new save file. Helmets were invisible but still equipped, the book was there and working, and settings properly carried over between maps, camps, reg. travel and fast travel. So I use the No Helmet Rulebook to unhide my helmet...and then my helmet just keeps getting unequipped. I've tried uninstalling the mod - same thing. please help. EDIT: I completely uninstalled/deleted it with DAO modmanager. nothing. I have the same problem. When I equip a helmet, the mod tells me I need the mod. I open the book to initiate the mod and am told it's showing the helm on that character. I open the book to initiate the mod again, and am told the mod is hiding the helmet. That's messing with the book 3 times to hide one helmet. This must be done for each character in my party that I want the helm hidden. So far, and I don't know why, my helmets are unequipped each time I restart my game, camp, or zone using the map. If I zone within a scene, such as rooms in Redcliffe Castle, the mod remains active and works great. For the sake of clarity, I installed this mod using the DAO Modmanager and not the DAupdater or Nexus Mod Manager. it could be possible to make it work with golems of agmarrak and witch hunt too?